Looking for the best Cross Country Skiing trails around Riverton? Find the top rated cross country skiing trails in Riverton, whether you're looking for an easy short cross country skiing trail or a long cross country skiing trail, you'll find what you're looking for. Click on a cross country skiing trail below to find trail descriptions, trail maps, photos, and reviews. It was a fun ride! I only rode till i saw the river. I started in Shoshoni and rod sit solo. Was a great ride pretty easy trails until going around the washed out place but still wastnt hard I could have went farther but I was alone. On my ride I saw one of Razor and some hunters. Great Ride for ATV's, Dirt Bikes, Ect. It was good from Riverton until we came to the bend in the river with no bridge. We had ridden approximately 4 miles. We tried to go around where the ATV's had went but someone had put up a fence without a gate for horses. Very disappointing because we had planned to make an all day trip to Shoshoni. not too long after we crossed the large wooden bridge the trail had a cattle guard and barb wire fence across the access. If I had wire cutters I would have been tempted to cut it due to the fact it is suppose to be for horses and whoever put the barb wire fence up could have put in a gate. I am very disappointed in the Rails to Trails. We have heard people talk about this trail so we investigated today on bikes. It is a very rough trail north of Riverton, more suitable for ATV's than bikes. About 7 miles north, the trail is washed out at the river, there are alternative trails blazed by ATV's to the top of the bluff and then down to the trail again, but it too steep for bikes, even walking them. So, we are pretty disappointed, wanted to ride the entire segment to Shoshoni and back to Riverton. The best part of this trail is the 1883 bridge and the sign "Smile Your on Camera". Couldn't figure out if it is supposed to be funny or someone couldn't spell. The trail in town is ok, but you have to cross major roadways (Main and Federal) without pedestrian lights, very scary! What a nice ride! And something of an adventure too. I found the start of the Wyoming Heritage Trail at the south end of Riverton. The path went right through the town in little segments that were very nicely done and then road crossings in between. The trail is paved through town and for another mile or so. After that it is more of an ATV trail where bikes are allowed. The surface is rough and rocky and suited more to ATV’s than bikes. Think constant jarring! That said however it was worth the ride and there were many places where it wasn’t too rough. Lots of wildlife and the scenery is great. The trail crosses and then follows the Wind River. After I’d ridden an hour or so I came to a place where the bridge was out. Out as in missing altogether. ATV’s had made a continuing trail up a very steep hill and I pushed my bike up this loose, slippery, slope. After a few hundred feet the ATV trail lead back down the other side of the hill in an even steeper angle that I didn’t think I could get down and back up. This was disappointing & I turned back. Minuses: I do wish the surface of this trail could be improved to make it more bike-friendly. I think most bike riders will be unhappy with the surface conditions of about 40% of this trail. Also I would have liked to continue towards Shoshoni but didn’t see a way to do it. The trail sections in town cross many busy streets requiring attention and patience. There is no designated parking for the trail. Pluses: This is a gorgeous area through farming country, marches, and river bottom-land. It could be one of the outstanding trails in the rail-trails system with some work on the surface. The old bridges are a nice touch! The wildlife was a nice surprise. A blue heron flew out just a few feet in front of me. There are lots of white-tailed deer and many rabbits and all kinds of birds. I could almost hear the sound of the train whistle as My wife and I rode this trail. Wyoming doesn't get much better than this. First part is paved then turns into some what of a semi mtb trail because of the mutiuse I only rode out too the tresle because I only had 700x32 tire But would like to do it too the end and return to Riverton. "I pedaled the Wyoming Heritage Trail on Saturday, August 27, 2005. Before my venture, I stopped at JB's Restaurant in Riverton for a delicious all-you-can-eat breakfast buffet. (The pancakes were especially good.) The trail runs directly behind this restaurant (824 North Atlantic Boulevard - Hwy 26). Starting from the back of this restaurant, you can go left(southwest)on the trail for about a half-mile to the end of the trail at the bank of a river, or you can go right and ride 22 miles in a northeasterly direction - all the way to Shoshoni. I didn't see any designated parking or trailhead signs in Riverton for the trail, but the town does have a Walmart Supercenter on Hwy 26. The trail crosses over Hwy 26 about a quarter-mile south from the Walmart. 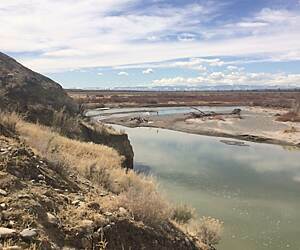 The trail is paved for about three miles in Riverton and about one mile in Shoshoni. In between, the trail is unpaved and not well maintained, but it is, for the most part, fairly easy to navigate with mountain bike tires. There were, however, two or three particularly rocky, lose dirt areas where I had to get off my bike and walk for a half-mile or so. The trail surface is clearly delineated from the surrounding pastureland, so I had no concern of mistakenly straying off of it and getting lost. Due to the somewhat rough terrain, this trail is not for one in a hurry. 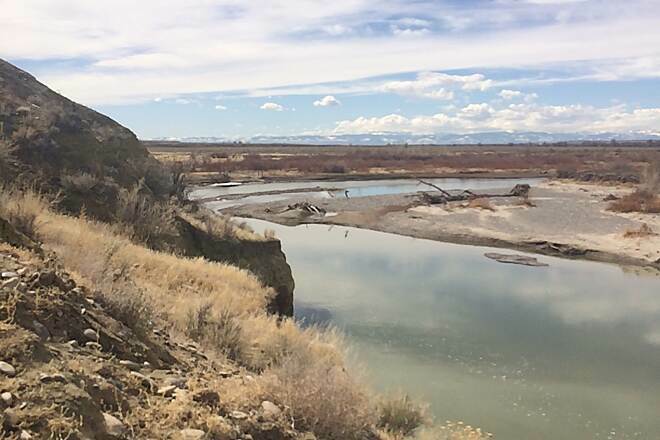 It took me about seven hours to go one-way from Riverton to Shoshoni - but I stopped along the way for a picnic and paused numerous other times to admire the scenery and take pictures(I'm attaching eight photos with this writeup). In between Riverton and Shoshoni, I only recall seeing one other trail user. He was on a motorized three-wheeler. One of the highlights of the ride was going across a railroad bridge that was built in 1883. There are about ten other bridges on the trail, several of which are in bad need of repair, but you can still walk across them, or if you prefer, walk around them through a dry river bed. The pleasant surroundings of this remote area made the ride on this trail most enjoyable. I saw cows, donkeys, and other livestock which even added more to my adventure. Instead of going both ways in one day, I spent the night in Shosoni. Shoshoni has two motels, both reasonably prived at around $35.00. (Shoshoni Motel and Western Motel). The Western Motel has a laid-back, mom and pop style restaurant with good food, and it's open for breakfast, lunch and dinner. Downtown Shosoni is an interesting town to gaze around. I enjoyed looking at the old billboards and abandoned two story storefronts. The next morning, I rode back to Riverton in two hours via Hwy 26. This road is excellent for biking; it has a wide shoulder and little traffic. I biked over a hundred trails while traveling out west last year, and this trail was one of my favorites. I highly recomend it to any bicyclist who enjoys nature in wide open, remote areas, and dosn't mind traveling at a slow pace. " "Our goal is to ride at least one Rail to Trail in every state and this is Wyoming's only offering. We inquired in Riverton about the location of the trailhead. A young man at the local bike shop just shrugged his shoulders. Finally found it. There is no signage - it is across the street from the old depot which is now a Mexican eatery on the main highway coming from DuBois on the westside of town. The sign board for the trail hadn't been attended to for some time and the whole situation wasn't very appealing. We went on the Shononi hoping to find better conditions. Again, no signs. I asked at City Hall and the response was basically ""why would anyone one want to do this ride"", ""There is nothing out there"" and ""watch out for the numerous rattlesnakes"". We did not ride. It is too bad that neither of these towns are capitalizing in anyway on having the trail.